When searching for a cheap AM/FM radio this past week, my mom stumbled across one at Goodwill amidst a shelf of electronic rubble. It carried a price tag of $5.99, but all pink tags were half-off, bringing the grand total to $2.99—that's $3.16 with tax. To put this into perspective, she paid a dollar less for this radio than the cost of a Quarter Pounder with Cheese from McDonalds. Not bad. However, there was no way to test the radio at the store and, until getting home and conducting a little research, she was oblivious to what type of radio she had purchased. The radio she acquired was, in fact, the highly sought after Sony ICF-2010 shortwave radio introduced in 1985 for $319 [that's $702 with today's inflation]. Sony manufactured the radio for nearly two decades before discontinuing it in 2004. As a portable shortwave radio, it boasted impressive capabilities for DXing hobbyists and accrued a large fanbase over the years. As a testament to the ICF-2010's longevity and impact, an active Yahoo Group of over 2,600 members still exists, with more members joining daily. Since being discontinued, the radio has thrived on eBay with most selling for $200-$400 depending on their condition. Interesting Tidbit: The Sony ICF-2010 was used by Ana Montes to secretly communicate with, and pass intelligence to, Cuba's Intelligence Directorate via shortwave frequencies before being caught in 2001. Getting back to the meat of this story, after putting in the required batteries (2 AA and 3 D) it became apparent that the radio had a serious power malfunction. Usually it had no power at all, and other times it had just enough juice from the AA batteries to display an 'Error 3' message on the LED screen—a relatively common occurrence with this line of radios resulting from age and general use. The radio would not come on no matter what was attempted. The first task for fixing the radio was to diagnose the existing electrical current. 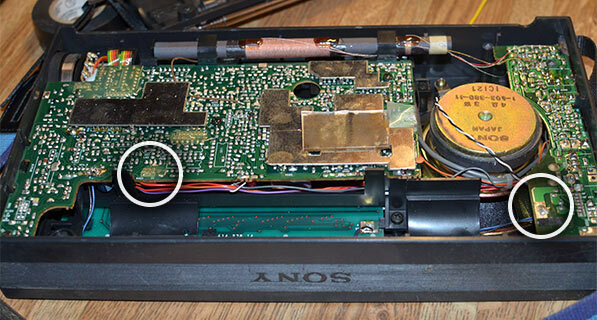 Seven screws hold the radio together, including one in the battery compartment. I observed one screw was missing along the case, suggesting a repair may have been attempted once before by the previous owner. With the back off, I used a digital multimeter to verify proper current was being received at the battery terminals. It proved touchy to get proper connectivity as a result of natural age, whereby the springs and related terminals had lost some of their oomph. So, I took a small tweezers and subtly stretched the spring coils to provide a more secure conduit for the batteries, being careful not to pull too much at the risk of breaking anything (it is a good idea to hold the base of each spring tight with your finger before stretching the coil). Carefully stretching the fixed battery springs to provide better contact with the batteries. Even with the coils now relatively firm against the batteries with steady current at each end, the bigger design flaw with this model soon became apparent. The D battery compartment is physically part of the back casing with no physical wires connecting them to the circuit board. As such, carrying voltage from the D batteries to the main circuit board relies strictly on pressure-based contact between the metal ends and two small solder pads on the main circuit board. Over time, the relatively scant solder from the manufacturer wears down and contact gets lost. To remedy this, I made a few final adjustments to the metal clamp on the other end of the D battery compartment with a needle-nose pliers and then added new solder to the pertinent pad locations on the circuit board to provide a more cohesive contact area. Adjusting the D battery contact and addition additional solder to the necessary pads on the main circuit board. Rather than building up the solder pads and adjusting the battery terminals to help with contact as I did, a more permanent solution would have been to connect dedicated leads from the battery terminals to the solder points. Alas, the method I took should suffice for quite some time and also allowed me to more efficiently verify the cause and solution. The two solder pad points that had to be reflowed due to age and natural degradation. With all of the tweaks and adjustments in check, the only thing left to do was to close up the radio and screw the two halves back together. Due to the physical pressure required to achieve contact between the battery terminals and the circuit board, tightly screwing the back of the radio into the front is a mandatory step to ensure adequate contact can be made. Having reassembled the radio, I put in all of the batteries and switched the main power switch to 'On'. The ICF-2010 includes a main power switch on the side along with a secondary power switch on the front; the side power must be set to 'On' or an error message will result. Having the extra power switch on the side helped ensure the radio didn't accidentally power on when traveling with luggage, but is also an easy feature to overlook. Finally, I slid the front switch to 'On' and heard the titillating sound of static. When tuned to a proper frequency, the sound came in loud and clear. Success! A quick search on eBay revealed that even 'non-working' models with the same problem as this one regularly sell for $130 or more. After fixing the bad contacts, the radio powers on perfectly. The official ICF-2010 manual describes some other possible causes for the four built-in error codes. "Error.3" is the most troublesome of the errors and also the most common these days; the real solution is likely more aligned to what I described here than what is explained in the manual. None-the-less, the specific causes from the manual are reprinted below and should be checked. In addition, you should make sure to have at least the two AA batteries installed even when using a power adapter to ensure proper functionality, as these batteries preserve the date/time and memory bank data and the radio may not operate without them. A frequency beyond the receivable range has been input. The band of the input frequency (AIR, FM or AM) is selected incorrectly. The programmable timer is operating and the key or the control you have touched cannot be activated. The MAIN POWER switch is set to OFF. Incorrect polarity of radio batteries. The AC power adapter or the car battery cord is not connected securely. Battery operation is attempted while an AC power adapter or a car battery cord is connected to the DC IN 4.5 V jack, but not to a wall outlet or a cigarette lighter socket. All the memorized stations are skipped. Erase the ◀ mark.